Adventures await with Hurtigruten’s Antarctica trips. These educational tours give you the opportunity of a lifetime to explore “The White Continent,” by expedition vessels led by expert guides. Choose a program to Antarctica, South Georgia and the Falkland Islands or a program to Argentina and Antarctica. These and our other Antarctica adventures will most certainly leave you breathless. Hurtigruten’s Antarctica trips are rich in education and exploration, voyages that encourage you to become one with the land and the people. 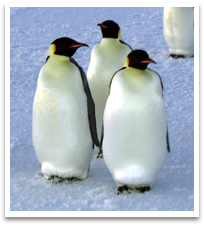 Explore the beauty of frozen landscapes, intriguing “tuxedo clad” king and macaroni penguins, glorious scenery, whales and seals, miles of icebergs and informative lectures on board and during landings. In addition there are optional shore excursions in Argentina and Chile for you to enjoy if you so desire. The following itineraries are just two examples of the expeditions we offer, call us for additional sailings.